I love the Bytown site updates - keep finding new bits of info on my very-hard-to-find ancestors there. 14 Aug 1867-19 Apr 1871 and an infant daughter, Catherine 13 Apr 1871-26 May 1871 also passed. 100% certain they married (probably 1857 or 1858) at St. Patrick's Fallowfield. to Upper Canada that you could send me, I would be most grateful. Thanks - once again - for a wonderful site and all your help. descendants left. I'm attaching a file with everything I have been able to collect to date. You can include this on the page if it's helpful. Here is a map showing the location of the Roderick Kelly 200 acre farm in 1879. Perhaps there's a Luther descendant out there who can enlighten me on that branch of the family! 1. JOHN1 KELLY was born Abt. 1790 in Ireland1, and died Sep 1870 in Nepean, Ontario, Canada2,3. and many others -- signed P.O'Connell"
2.	i.	RODERICK2 KELLY, b. 1830, Ireland; d. Bet. 1892 - 1899; Stepchild. Ireland, and died 20 Apr 1871 in Nepean, Carleton, Ontario, Canada5. From Roderick Kelly's bible:  Rody Kelly, his book, dated the 18th day of December 1864. "Rody Kelly is my name. America is my nation. Nepean is my dwelling place and heaven is my expectation." Richard and Roderick Jr. were sick with scarlet fever and died on the 19th and 23rd of April. The baby, Catherine then died of "failure to thrive" (malnutrition) 6 weeks later. never married. John Kelly (Jr.) eventually emigrated to British Columbia. He never married. William Kelly apparently married and moved to somewhere in "western" Canada, possibly Alberta or Saskatchewan. Medical Information: 38 years old. Wife of Roderick Kelly. Roman Catholic. iv. WILLIAM KELLY, b. 09 Jun 1864, Nepean, Ontario, Canada7,89. and Ann S. Keahan (?Keenan) signed P. O'Connell. Medical Information: Age 5 1/2 years, Son of Roderick Kelly and Catherine Luther. Medical Information: Male -- 3 1/2 years of age,  Son of Roderick Kelly. d. 08 Sep 1875, Ontario, Canada16,17. (Rody Kelly)   Male -- aged 6 years. d. 26 May 1871, Carleton, Ontario, Canada. Female -- 6 months old. Alsace25,26, and died 01 May 1927 in Syracuse, Onondaga, New York27. formerly residing in Wilkinson St. She was a communicant of Saint John the Evangelist Church. Mrs. Frank Perli and 11 grandchildren. Services will be conducted in the McKinley Bros.
a solemn high mass of requiem will be celebrated. Burial will be in Saint Agnes Cemetery. Bridget's grandfather, JOHN KELLY b. 1790 in Ireland, emigrated to Canada in the early 1800's. BRIDGET KEENAN KELLY b. abt. 1790 in Ireland, and children. 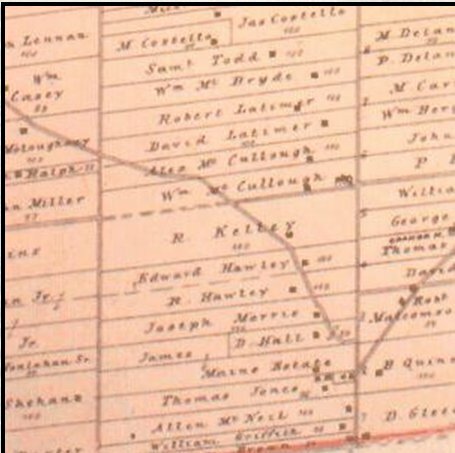 Reaching Out Ireland and the digitization of Ireland's records online, I've finally made some progress! Crotta, Borrisokane, County Tipperary, and baptized on 27 Sep 1833. Her sponsors were listed as Josh (probably Joseph) LUTHER and Marie CLARKE. It appears she had 4 brothers: Joseph (1831), William (1836), Richard (1839) and John (1841). connection to the Nepean community. In turn, it would appear that they were related to many of the Nepean families.